Ford: Can The Giant of The Automotive World Stay In Front of The Electric Race? Recently Ford announced its foray into the world of electric cars with its new Ford ECOnetic Technology. It’s a slightly lacklustre offering in my opinion, from a manufacturer that is one of the oldest and most established marques in the industry. Start/stop technology is present, turning your car off when you stop at a red light for instance, but really that’s not that often, decreasing CO2 emissions and fuel consumption by 5%, it’s not earth shattering. Power assisted steering is now done electrically, being used only when needed. I’m pretty sure you steer most of the time whilst driving unless you live and work along the A15. Not much use there then. The gear shift indicator light notifies you when is the most efficient time to change gears. I can’t imagine the magnitude of difference that will make to fuel consumption. Oh, and the front grille opens and closes to improve air flow and will heat your car up quicker in the cold weather we’re currently experiencing. This is basically Ford saying no to producing electric cars, for whatever reason, I hope it’s a good one. They’ve made implied some novel ideas, tagged it with the word ‘Eco’ and hoped for the best. Their competitors are fiercely changing the way they manufacture and market cars, whilst Ford are sitting relatively still. Perhaps to see the outcome of the race, but can they afford to wait? 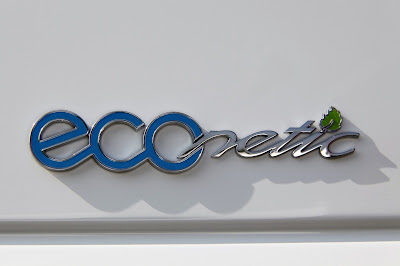 You can check out the‘new’ Ford ECOnetic range at one of your local Ford dealers and see for yourself.